Friday 23th June - 6pm @ the Games Field. Saturday 24th June - 3pm start @ the Games Field - Register at the Secretary Hut. Past Chieftain Guenter Thamm owned Drumtochty Castle from 1987 to 1998 along with his partner Steven Watson and they were very responsible landlords and generous sponsors. Sadly he passed away in 2010 and in his memory a plaque was unveiled at the Chieftain’s Bothan at the 2011 Games. Good Afternoon Ladies and Gentlemen and behalf of our Committee and Chieftain, Alastair Reid a very warm welcome to the 34th Drumtochty Highland Games . The sun is shining for us all today and this very special Glen of Drumtochty is at its scenic best and if Charlie and Dotty Anderson , the owners of these grounds can hear us in Canada--many many , thanks for allowing us our annual tenure of your Castle Grounds. Despite all the counter attractions of Wimbledon, the World Cup Football, the Highland Show - we are overjoyed to see so many spectators and a very special welcome to our overseas visitors. Today is the result of a lot of hours of work by our Committee under the stewardship of our new Chairman John Singer. 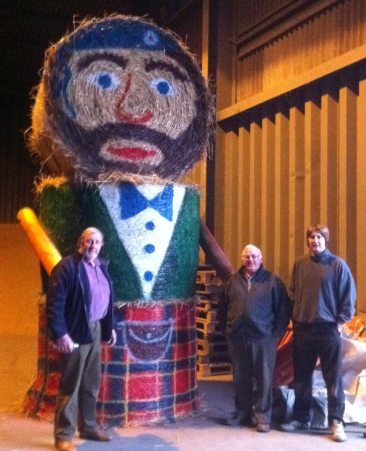 John succeeded Torquil McLeod who was Chairman for four very successful years . Torquil has not abandoned us and remains a valuable member of the Committee. John’s father Mac was one of the founding members of the games and the Family are generous sponsors. We wish John and Jenne many happy years in the Chair. We are delighted to have recruited a number of new members and we trust that they enjoy their committment to the Games. Highland Games are not sustainable through the gate money and we are delighted to have sponsorship from many diverse business’s and we thank them for their generosity. `When we started out in 1978 we looked around for someone to be Secretary and Alistair Reid was suggested. Well the rest is History. Alastair retired this year from the Committee having completing some 24 years as secretary and 28 years as treasurer. But these statistics do not give you the whole story. Alistair was far more than just sec and treasurer - he was totally committed to making Drumtochty a success and the early years needed a lot of effort and innovation. And Alastair was at the forefront of these initiatives .What the present Committee has inherited is a games that has shed many the unsuccessful events and has now settled into a successful format with equipment, programme etc in place but it still of course requires a great deal of endeavour to make it happen every year. Over the years Alastair has had great support from his Family -Helen, Philip , Peter and Neil and we are delighted that they are with him today .Throughout these many years of committment Alastair has kept a very low profile and today is no different. So on his behalf I wish all the competitors every success , may the stalls have a bumper day of trading, may the judges have an enjoyable and trouble free afternoon , may the Lonach, Towie, Newtonhill,Huntly and Lathallan pipe bands under the stewardship of Ian Robb play with style and verve and we are just delighted to have Robbie Shepherd with us again. Ladies and Gentlemen and I have great pleasure in asking our Chieftain Alistair Reid to take the salute of the pipe bands and declare the 2010 Drumtochty Highland games open. 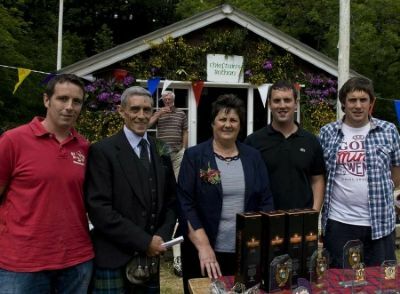 The video below from the SGA's Braemar Gathering, on 6th September 2008 shows Bruce Aitken, from Auchenblae, Aberdeenshire, being presented by Her Majesty the Queen, on winning his 10th consecutive, 'Glenfiddich Open Heavy Events Championship.